Meditation is one of Buddhism’s essential practices toward spiritual liberation. Pondering Pond by Yung Shu Chao challenges our social preconceptions by employing Zen koan (a paradox to be meditated upon as part of Zen practice) and origami. The installation combines these two viewer-participatory activities to promote a meditative experience for willing individuals. Both activities require concentration that quiets busy minds and encourages us to abandon our usual dependence on reason to gain freer access to our intuitive faculties. The Koans are selected with a young audience in mind: but narratives such as “The Story of a Little Fish,” prompts a response from people of all ages. 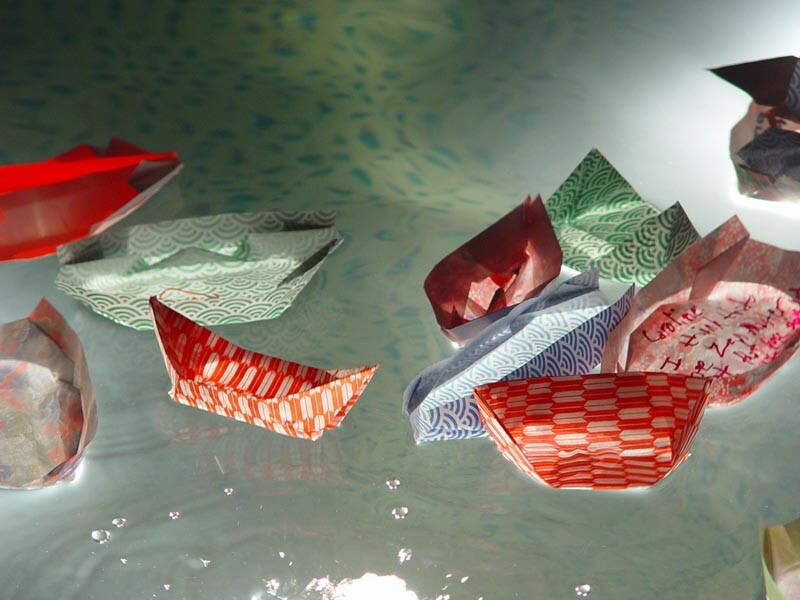 After writing down their answers on a sheet of origami, participants fold the paper into a boat or a Lotus flower and release them on an illuminated pond. Illuminated water, which communicates a fluid and elastic perception of time, will accumulate Koan-written origami shapes on the bottom of the pond. Periodically the origami will be salvaged from the water and posted on the gallery wall. The Taiwanese artist Yung Shu Chao is not a Buddhist, but has recently been intrigued by what Buddhism offers to enrich one’s life. Pondering Pond is a humble proposal born out of a healthy balance of artistic curiosity and spiritual generosity; it attempts to explore Buddhism, Zen, or koan, which, at first, seems to be foreign for many of us, but not once we are engaged. Yung Shu Chao was born in Taipei, Taiwan in 1963 and moved to New York in 1994. He received his B.A. in Psychology from Fu-Jen Catholic University, Taiwan (1987), and an M.F.A. from The City College of New York, New York (1996). His individual exhibitions include: Buddha, White Dwarf and the Sample of Time, Taipei Fine Arts Museum, Taipei, Taiwan (1999), Nono’s World, 456 Gallery, New York, New York (2000), and Aurora, Jamaica Center for Art and Learning, Queens, New York (2001). Chao participated in numerous group exhibitions that include: Global Priority: Artists Network through Mail Art, Jamaica Center for Art and Learning, Queens, New York (2002), and Greater New York, P. S. 1 Contemporary Art Center, Long Island City, New York (2000). ArtZone is made possible by Emigrant Savings Bank. Pondering Pond is made possible by The American Center Foundation, Cowles Charitable Trust, and The Greenwall Foundation. The Buddhism Project has been supported by the Asian Cultural Council, the Andy Warhol Foundation for the Visual Arts, the New York Council for the Humanities, the National Endowment for the Arts, and the Rockefeller Brothers Fund.